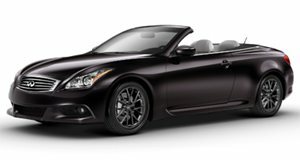 With Lexus’s SC convertible having been such a sales flop, Infiniti knew that when they set out to create a vehicle that would be aimed at essentially the exact same small group of customers, they would have to be sure to get it right. The G convertible is therefore more practical, better looking and noticeably less expensive than the old SC was. The folding metal roof G convertible is exactly what you would want out of an Infiniti convertible. It is a stylish and spacious, but not boat-like, open-top boulevard cruiser. A Chrysler 200 would be a cheaper option, but just not as nice.